If you’ve been battling insomnia for years, there’s a chance of breaking that cycle thanks to new technological improvements. While melatonin and other over-the-counter products work for some people, others simply prefer not to take medication for sleep. Other treatments include anti snoring devices, which can help with sleep regardless of the severity of your snoring problem. There is now a range of apps, pillows, mattresses, and other products available to monitor and improve your sleep. Your best options will depend on the cause of your sleeplessness. If poor sleep habits are keeping you from getting at least seven hours a night, an app may be able to help. If snoring is causing disturbances, you or your partner may need to tackle that problem before trying anything else. Check out our full list and keep your options open as you troubleshoot your insomnia. Unlike other systems that require a wristband or other attachment to your body, S+ sleep tracker uses motion detection to figure out when and how you’re sleeping. S+ also has sensors for temperature and sound, making it easier to figure out what’s waking you up at night. The resulting data can be easily accessed from your smartphone. Studies reported that 69% of patients had better sleep within their first week of using S+, which shows that the system’s ability to track, identify and communicate issues to users is above average. If you don’t have room on your nightstand for a large sleep tracker, Beddit can attach to your mattress to get the job done. The sensors sync with an app on your smartphone to provide insights into your sleep cycles and schedules. The device is extremely thin and small, but can measure a wide range of data, including temperature, humidity, and noise. Cutting-edge gel mattresses are starting to make a splash thanks to their amazing comfort. 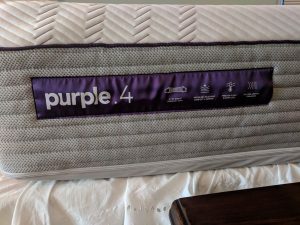 I recently reviewed the Purple 4 Mattress, which is temperature-neutral, recyclable, allergen-resistant, and much more. 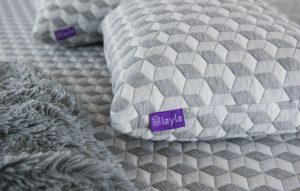 If you think an outdated mattress or back pain are causing your sleeplessness, consider trying a high-tech mattress instead of a traditional spring-loaded one or a simple foam mattress topper. If you wake up hot in the middle of the night, your first instinct may be to get out of bed and adjust the air conditioning. A better solution may be to buy temperature regulating sheets next time you’re at your favorite home goods store. The technology in many temperature regulating sheets are used by NASA to keep astronauts comfortable in space, so you know it works! The faint blue light that comes from your laptop or smartphone screens can trick your body into staying awake longer. While it’s better to eliminate screen time altogether while trying to fall asleep, special glasses can help mitigate the exposure to blue light. Glasses from EyeBuyDirect are perfect for reducing blue light if you can’t avoid late-night electronics usage. They may also help with eye strain caused by excessive computer usage during the day, so they’re an excellent investment for people who use computers frequently at work. There are a variety of apps that claim to help you sleep, but if a restless mind is what’s keeping you awake at night, meditation may be your best option. There is a range of meditation apps available that can walk you through best practices for meditation and time your efforts to keep you focused while getting you to bed on time. Just make sure to use your phone in night mode, if possible, to cut down on blue light exposure. Many sleep aid apps use screen colors that minimize blue light emittance, but some meditation apps designed for daytime use might not have this consideration. Like with meditation apps, there is a wide range of apps that can emulate ocean sounds, fans, and other white noise. These apps aren’t just great for drowning out other noises, though – they can help you unwind and get to sleep at the end of a long day. They’re often a better option than listening to your usual favorite music, which can evoke emotions that can keep you awake longer. There is a vast array of free and paid apps available, and some have a surprising range of customizable options, so try a few to see which ones work best for you. Blackout curtains aren’t just for people who work night shifts or have children. A well-made set of blackout curtains can also help insulate your windows and even cut down on noise from outside. Depending on how much daylight your region gets and where you are in your timezone, a very early sunrise could be provoking some sleep issues. 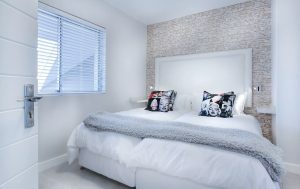 Try blackout curtains if you think noise or light problems – or even a drafty window – could be causing sleep difficulties.